The rustic lodge decorating style is closely related to nature. It originated with the construction of primitive mountain cabins in Old World Europe. The cabins were located in remote areas where it is difficult to transport materials to so the construction relied upon native materials by necessity. Unfinished timber, logs, branches, animal skins, and unpolished stones were and still are hallmarks of the style. The look took hold on the American shores amidst the industrial revolution in the late 1800’s. Wealthy New York City dwellers began visiting the Adirondack Mountains to escape the crowds and enjoy the undeveloped wilderness. Lakeside camps sprang up that eventually developed into luxurious lodges decorated in the rustic style. The rural charm of mountain living has now become a part of homes everywhere and encompasses popular interior styles such as southwestern, country, log cabin, lodge, western, and farmhouse style decorating. A rustic interior emphasizes the natural; with unrefined texture, woven fabric, weathered metals and wrought iron. In the tradition of the Adirondack style, rustic decor also celebrates the natural beauty of wood. Stick work railings, furniture, and shelving are completed with the bark still on, adding twiggy charm. Leather and suede are another key element of the lodge look. Animal skins can be used in a variety of places and fit with the natural tones of the rustic color palette. Upholstered furniture is also covered in natural fabrics such as cotton, hemp, linen, and wool. Woven fabrics warm up the interiors and create soft, cozy atmosphere. Fringe and nail head furniture is frequently used, particularly in Western and Southwestern room settings. Animal motifs are frequently incorporated into the rustic style. Bears, elk, birds, moose, and deer are presented in various scenes. Antlers can be used in the construction. This style celebrates nature and its inhabitants. Since rustic furniture is extremely textural, it can make an impact with small amounts. Try a few bent branch chairs, rustic style floor lamps, or a Southwestern rug. The larger the piece, the more impact its design will have. Smaller rustic furnishings such as home décor, sconces and mirrors can set the tone in a subtle way. To experiment with the rustic style another way, try accent pieces such as tables, mirrors, coat trees, or other accessories in a guestroom or powder room. Smaller spaces can be theme-decorated with just a few accessories or lighting. Sconces, pendants, table lamps, and swing arms can add soft, indirect light that creates a cozy feel. The rustic style is great for outdoor spaces as well. Landscape and wall lighting with rustic styling fit right into a natural setting. Bronze, copper, wrought iron, and other metals patina beautifully and look terrific surrounded by plants. A lodge-themed interior can be completed by adding new home decor accents. Look for earth toned accessories, galvanized tin accents, simple pine cones, copper elements, earthenware containers, colorful quilts, and soft pillows. Sportsmen and women alike may appreciate hunting or fishing themed accents to reference their favorite pastime. There are a variety of offshoots of the rustic style which overlap and dovetail with a rural lifestyle. Different corners of America have interpreted the native attributes of their locale, putting their own geographic spin on this natural style. For example, the typical Southwestern home blends Native American-style elements, Spanish, and Mexican influences together for a casual, natural style. A rustic Southwestern room features the same rough-hewn wood surfaces, leather, and wrought iron details as the East Coast version. However, the colors of the woven textiles are more vibrant and can be hung on walls. Hand-crafted elements specific to the region such as painted stoneware and terracotta are introduced. Hand-painted ceramic or clay tiles often replace the beautiful wood surfaces of the Adirondack style. A home doesn’t need to be in a far-off locale to have that cozy cabin charm. This look can warm up any space whether it’s in the middle city or in a quiet suburb. You’ll feel at home anywhere with this natural, relaxed style. 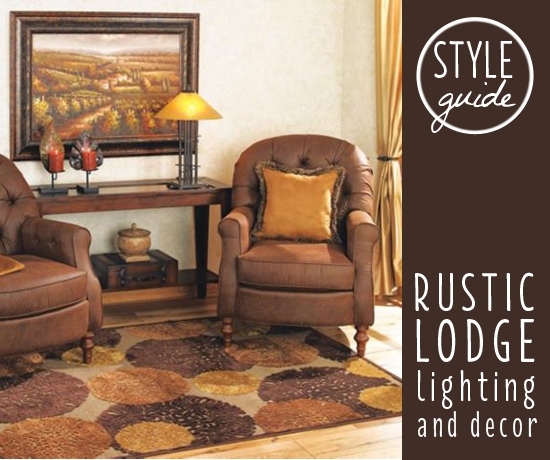 Our American Lighting Association trained consultants are here to help you with questions about rustic/lodge design. Use the Lamps Plus store locator to find a superstore location near you, or contact us for more information! Check out the Lamps Plus YouTube channel for inspiration, where you will find videos like the one below on the organic decorating trend, or use one of the following links to view more design ideas and tips.